We offer a wide selection of Embroidery Blanks, Home Machine Embroidery Supplies, Fine Linens, Handkerchiefs, and Unique Wedding and Baby Gift Items specifically selected so you can add your own personalization to the item with your embroidery machine. Our goal is to provide you with Quality Products, at a Fair Price, with Excellent Service. We want you to be 100% satisfied with your purchase and with your shopping experience at Embroider This! Embroider This! publishes a Free Newsletter about every 2 weeks. This newsletter is sent by e-mail and will keep you up-to-date on new product introductions, tips and tricks, coupons and specials, as well as a host of other useful information about machine embroidery. You can sign up on the home page of EmbroiderThis.com to receive this free e-mailed newsletter. When you sign up for the Embroider This! newsletter you also get immediate access to over 200 Free Machine Embroidery Designs you can download and stitch on your embroidery machine anytime. These free designs are offered in over 15 different file formats to accommodate most home and commercial embroidery machines. We add new free machine embroidery designs to our collection each month. Below you will find answers to the most Frequently Asked Questions about EmbroiderThis.com. If you have a question about our store or merchandise not found here, you can email us at info@embroiderthis.com or call Toll Free 800-881-8144 and we will be happy to assist you. Our office hours are Monday – Friday 9:30am – 4:00pm EST. Can you Embroider on items for me? What are your Business Hours? What Holidays are you closed? Our business hours are Monday – Friday 9:30 AM – 4:00 PM Eastern Standard Time. Our holiday schedule mirrors the UPS holiday schedule and varies a bit year to year. If UPS is shipping, we are normally open, even if the U. S. Post office is closed. Can I feel safe putting my credit card information on your website? Absolutely. Embroider This! is proud to offer you a safe and secure shopping experience. All of the pages that contain any of your personal information on our website are served only through a secure https connection using 128-bit SSL v2/v3 encryption. That means all of your credit card information as well as any other personal information like your name, address, and phone number is fully encrypted when it is sent through our system. Our stores are hosted by Yahoo!Store, one of the most trusted names in e-commerce website hosting. In addition, our website is monitored and tested daily by McAfee Secure to further help protect you from any online threat. Read more about McAfee Secure on Embroider This! by following this link. The Better Business Bureau has certified Embroider This! (under our parent company name of Bobbin Inc.) as an Accredited Business since 2005 and we currently have a BBB rating of A. Follow this link to read more about the current standing of Embroider This! at the Better Business Bureau . Rest assured that we are using the latest in business and website security technology to protect your personal information. What about privacy? Do You Sell or Share my information with others? Never. We know that you have put your trust in us when you place an order with Embroider This! and we take that trust seriously. We do not sell or share your information with anyone else. The information you provide is for our eyes only. Do you offer items not shown on Embroider This! ? No. Our complete product offering is shown on EmbroiderThis.com. Do you sell your products at Wholesale? Yes. We are able to offer a select group of our products at wholesale pricing though our sister website Wholesale Linens and Embroidery Supplies to businesses who register with us. Wholesale pricing is offered only to clients who register and provide proof of business ownership and who meet the wholesale minimum purchasing requirement. Visit our wholesale website, Wholesale Linens and Embroidery Supplies , to see which specific items are available for wholesale pricing and to register for access to the wholesale pricing structure. Note: A User Name and Password are required to access the wholesale pricing structure. Register online at Wholesale Linens and Embroidery Supplies or call us toll free 800-881-8144 for assistance. We pride ourselves in offering fast shipping service! We stock all of the items you see offered on Embroider This! in our warehouse in large quantities and normally ship your package the next business day after you place your order online. We rarely experience backorders, but if something you ordered is out of stock and is not expected to arrive within a day, we will contact you to advise you of the delay. What Carrier do you use to ship my order and When will it reach me? The standard shipping methods for EmbroiderThis.com. are UPS Ground Service and United States Postal Service (USPS) Priority Mail. We choose the best method to ship your package based on the size, weight, and value of your order. In addition to these standard shipping methods, we also offer you the choice of UPS 3-Day Select, UPS 2nd Day Air, and UPS Next Day Air. Embroider This! orders are normally shipped the next business day (Monday – Friday) from when you place your order online. If you need your shipment to go out the same day that you place your online order, please contact us toll free at 800-881-8144 before 1pm Eastern Standard Time and we will do our best to accommodate your request. We typically use United States Postal Service Priority Mail as the standard shipping method for orders under $100 in value and under 3 lbs. in weight. Priority Mail service generally takes between 1 and 4 business days to reach you. A tracking number provided by the U. S. Post Office will be e-mailed to you the day we ship your package. Please watch your e-mail trash folder as these automated notices can be intercepted as spam by your spam-blocker program and placed in your e-mail’s trash folder by mistake. We do not ship by regular mail service or parcel post. Your order is very important to us and we are committed to offering you the fastest, safest, and most reliable methods available! We typically use United Parcel Service (UPS) Ground Service as the standard shipping method for orders over $100 and/or over 3 lbs in weight. UPS Ground time-in-transit, is the time it takes for your package to reach you once it leaves our warehouse, and varies depending on the destination of your package and the service selected. The Embroider This! warehouse is located on the East Coast, so shipping using UPS Ground Service can take as little as 1 day to an address on the East Coast or up to 5-6 business days if we are shipping your package to an address on the West Coast. UPS time-in-transit does not include holidays, weekends, the day you place your order, or the day your order ships from our warehouse. We normally ship orders the next business day from when you place your order online. Orders are downloaded for process at about 8:00am EST each business day. All orders that have been placed online since the previous day’s download will be included in that shipment. The time-in-transit UPS Ground delivery date starts the day after your package leaves our warehouse. You can use the map below to determine how many days after we ship your package by UPS GROUND you can expect to receive it. In an effort to provide you with the very best service, we are now sending all UPS shipments for orders over $200.00 in value by UPS Signature Required service. Signature Required means that UPS will not leave the package unattended at your door if no one is there to sign for it. If you are not there when UPS tries to deliver the package, they will leave a notice on your door to let you know they tried to deliver the package. In most areas, if you will not be available when they indicate they will try to deliver the package again, you can sign the notice and leave it for them requesting the package be left at your door. Your signature on the notice will be the signature required for UPS to leave the package unattended. If you do not wish us to use this service for your order over $200 value, simply indicate your wishes in the “Comments” section when placing your order and we will not send the package Signature Required. For your convenience, we also offer UPS Expedited Services of 3 Day Select, 2nd Day Air, and Next Day Air. The rates for expedited services are in addition to any applicable standard shipping costs and are outlined below under the question: “What do you Charge to Ship my package”. UPS 3 Day Select means UPS guarantees to deliver your shipment by the 3rd business day from the day your order leaves our warehouse . UPS 2nd Day Air guarantees your package will be delivered on the 2nd business day from the day your order leaves our warehouse . Next Day Air is guaranteed to be delivered by UPS on the next business day from the day your order leaves our warehouse . Business Days are Monday through Friday and exclude weekends and holidays. If you place your order online at EmbroiderThis.com on Thursday, it will be packed and shipped by us on the next day, Friday. If you requested Next Day Air, your package be delivered to you on the following Monday. If you requested 2nd Day Air, your package will be delivered to you on the following Tuesday. If you requested 3 Day Select, your package will be delivered on the following Wednesday. An automated e-mail containing the tracking number for your shipment is sent to you by UPS on the day your order ships from our warehouse. Please watch your e-mail trash folder as these automated notices can be interpreted as spam by your spam-blocker program and placed in your e-mail’s trash folder by mistake. What do you Charge to Ship my package? 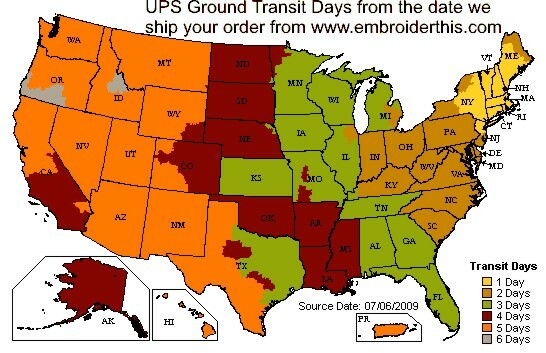 The EmbroiderThis.com Shipping Rates Chart below is applicable to orders shipping within the continental United States. These shipping rates are based on the non-taxable amount of your order. Add $20.00 to the above applicable rate for your order for UPS 3 Day Select. Add $30.00 to the above applicable rate for your order for UPS 2nd Day Air. Add $45.00 to the above applicable rate for your order for UPS Next Day Air. Note: If the actual charge for Next Day Air service exceeds $45.00 or the actual charge for 2nd Day Air service exceed $30.00, you will be charged the actual amount. In this event, we will attempt to contact you via e-mail to advise you of the actual charges before shipping. Add $10.50 to the above standard shipping rate for your order if shipping to Alaska, Puerto Rico or Hawaii. Sorry, Next Day, 2nd Day, and 3 Day Select shipping is NOT available to Alaska, Puerto Rico or Hawaii. We want you to be completely satisfied with any product you purchase from Embroider This!. If an item did not meet your expectations for any reason, you may return it within 30 days of purchase for a full product refund. When we receive the returned item, we will credit your credit card account promptly and mail you a copy of the credit memo. Of course if your order was incorrect or any product was defective, please contact us right away and we will make it right, at our expense. Exceptions: Closeout or Clearance Items are not returnable. Please include a copy of your sales receipt, the reason for your return, and your contact information to help us expedite your credit. Yes. You can mail in your order and pay using a personal check or money order. When mailing an order, please list the item number, the item description, the size and color of the item if applicable, and the quantity of each item you are requesting. Include your name, address, phone and an e-mail where we can send the tracking number for your package. Reference the section on Shipping Rates above to add any applicable shipping charge to your order total . If you have questions please give us a call toll free at 800-881-8144. Note that orders paid by check or money order may not ship from our warehouse until the check or money order has been posted to our bank. Please allow up to 7 business days for checks or money orders to clear. Massachusetts residents must pay 6.25% sales tax. This amount will be automatically calculated for applicable items on the website and added to your order total at the check- out. Residents of other states are not charged sales tax. Very Soon! We will be launching our international shipping option in late February 2010. We will notify you in our newsletter when this exciting option is available and provide you with all the details then.